Connecting to other educators online and listening to their experiences, tips, and successful practices is my primary pathway to lifelong learning and improving my teaching skills. 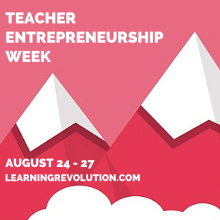 Teacher Entrepreneurship Week held on August 24-27, 2015 is a great opportunity for teachers to update their expertise and try to cope up with all the recent trends of teaching and learning. In case you missed this event, here is all the stuff recorded on YouTube.